...and more including Checklists, WBS Charts, Kanban Boards, RACI Chart, and Risk Log. Get Your GANTT Chart Here. features in a simple interface. Quickly schedule your project's tasks with our online GANTT chart creator tool that auto-schedules dependencies for you. Point and Click Online GANTT chart tool. Quickly drag and drop GANTT tasks to update start and end dates for project activities. Automatically schedule tasks with dependencies. Easily re-schedule individual or groups of dependent tasks either in the gantt view or within the task info panel. Easily modify your online gantt chart task's duration with just a few clicks. Mark task completeness with a click. 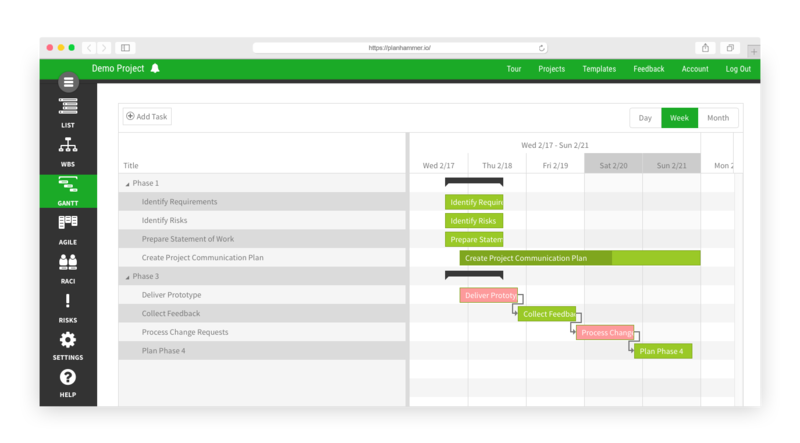 Update and view each task's progress directly on your gantt chart. Easily see what’s coming next. so that your project schedule is clear to you and the entire team. What’s done and what’s left at a glance. Updating task progress is a simple hover and click away with intuitive in context menus that put simple interfaces on top of a powerful online gantt chart tool. Identify which tasks are most important. Critical tasks are automatically marked as you progressively elaborate, making your gantt chart generation tool an integral yet unobtrusive part of your planning and controlling process. As you work through your project’s structure, switch between zoom levels so that the big picture is always kept in alignment whilst not letting the details slip or lose focus when getting in the flow. The full featured dependency set including leads and lags are presented on all tasks info panel, as well as visually on the gantt chart diagram. Show when tasks are due. As a project manager, easily set due dates visually, or give project resources the reigns so that they can set estimated end dates which then roll up to generate your GANTT chart for you.